This is a little puzzle I heard a while back from one of my mathematically inclined friends- I get the sense that it's bounced around a little, so forgive me if you've heard it. There is a sort of function that, given any positive whole number, will return another positive whole number. Interestingly, there is one number that will return itself- the number 4. There are no other loops of any size, so you can start at any other number and, by repeatedly plugging in the output of the function, you will eventually reach 4. 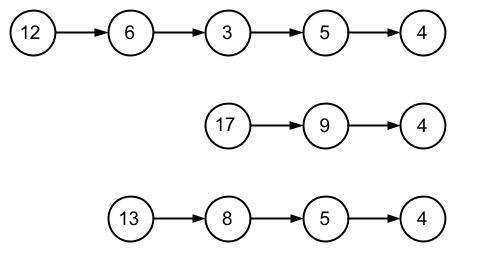 Given this diagram showing a few examples of those succession chains, determine the function. Each number is followed by the number of letters in its spelling, but four leads back to itself indefinitely! Four is the only cosmic number because it is the only number with its own number of letters in its English spelling, and there are no cycles of two or more words that have each other's letter counts. Not the answer you're looking for? Browse other questions tagged logical-deduction pattern number-sequence english reachability or ask your own question.